Celebrity Woburn Petite Dual Motor Rise and Recline Chair. This is the smallest chair in the Celebrity range. The dual electric motors allow the back of the chair to be adjusted independently of the footrest. The fifth button resets the chair to sitting position. The chair reclines for a nap and lifts you to standing position at the touch of a button. Ideal for anyone with mobility difficulties, elderly or recovering from an operation. The chair is in a neutral colour and would blend with most decor. 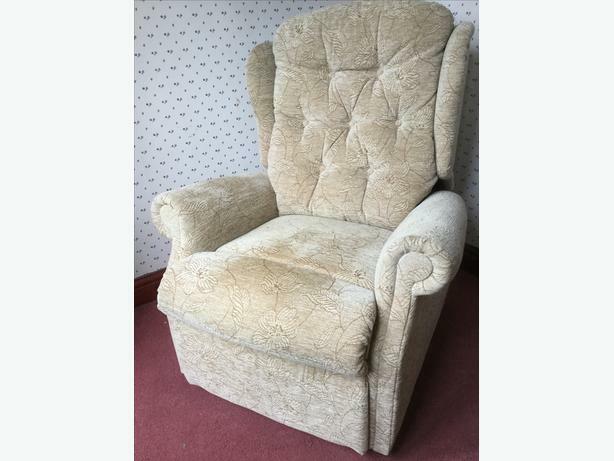 The chair is in excellent condition and from a non smoking home. There are no stains on the chair,shading is due to the fabric pile.